We are bottom of the league. Or we should be, at least, if the numbers are to be believed. To misquote Mark Twain, ‘there are three kinds of lies: lies, damned lies, and statistics’. Unfortunately for Sheffield Wednesday this season, statistical evidence backs up what fans fear is a relegation battle ahead. There’s plenty we can take from the seemingly infinite facts and figures produced from tracking every movement across every blade of grass over 90+ minutes these days. Owls About Stat is a new podcast delving into those figures and ‘looking at Sheffield Wednesday by numbers’. Let’s just get this out there now. It’s bad - real bad. There’s just no way of flowering it up. So far, we are rock bottom of the league for Expected Goals Against (xGA). This is the number of goals a team is expected to concede, resulting from the chances the opposition created and positions their players get into. We’ve actually let in 36. About 1.6 per game. It isn't much better at the other end of the pitch. We're among the worst for Expected Goals scored (xG), at 20.9. We’ve actually scored 25. Put it all together and our expected points so far this season is just 10, putting us rock bottom in 24th. We’ve actually accumulated 23, so the ‘lie’ is really our falsely high league position, relative to our performances. The fact we scored three goals from three shots on target against Bolton and Blackburn highlights just how little we are creating - and illustrates how much we’ve overachieved all season thus far. Is there any shining light? A bit of positivity to balance out all this doom and gloom? Well the wonder goal is certainly an area we excel. No other team in Europe’s top five divisions have scored more goals from outside the box this term, with four of Adam Reach's five league goals coming from long range (he just doesn't do tap ins!). Owls About Stat is a new podcast delving into those figures and looking at Sheffield Wednesday by numbers. That’s right, on this one measure, Wednesday are better than Madrid, Juve and the rest. Who wants to see a rubbish team score rubbish goals anyway? Of course, stats don’t give a true reflection of what we can see with our own eyes. We all know there’s surely enough quality in this squad to comfortably maintain Championship status and we see the somewhat baffling decisions which seem to have led us down a difficult path. 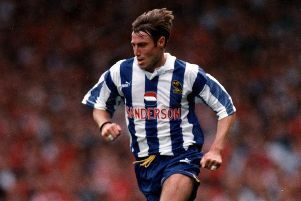 Make no mistake, we are in a real fight, and not showing many signs of being up for it at the moment - so your move, SWFC. *Owls About Stat is a new monthly podcast sharing analysis on all things Sheffield Wednesday. Look out for more material including weekly analytics and match statistics in the new year. Twitter: @owlsaboutstat, @JamesMarriott, @ManhattanOwl and @ploehmann.